Austin Kristof, for example, has begun soldering circuitry for our recently acquired smart, condition monitoring devices. These new GraceSense products require a great attention to detail, both on the software and hardware ends. Austin showed me what he's been learning for the process of making the tiniest solder joints you've ever seen. As a Production Select Parts Specialist, Austin can be found with a myriad of custom GracePorts at his work station in various stages of development. He was enlisted by Grace at 18 years old and six years later, each day is still capable of presenting a new challenge he's ready to tackle. When Austin's not soldering or building GracePorts or PESDs, he enjoys riding motorcycles, working on car projects, and spending time with his family. Before Austin can completely assemble a GracePort, he depends on Lyle Tharp for the countless faceplates that have been created for custom orders. With thousands of custom variants made, Lyle is responsible for designing and producing faceplates for custom PESD combination units and GracePorts alike, including printing of company logos onto the device. Whenever a new order is received for a custom GracePort, Lyle helps determine how the components and power options will layout. As our one and only laser technician, his workspace looks like a lab, which is fitting for a guy who basically worked as a chemist at a plating factory for over a decade before coming to Grace. Lyle will be the first to tell you he loves what he does both at work and away with hobbies that include skateboarding, snowboarding, biking, fishing, and camping. Actions speak louder than words with these next two; Ling Zou and Brett Hart each shared with me a few details about their operations at Grace. Ling has been with us for six years, while Brett has been aboard for almost a year and half. They work in picking inventory for production, building GracePorts and PESDs, and kitting products for shipment. First to be featured in two HUMPDAY Meet & Greets; Wanda Steward served in Inside Sales for a period of time before returning to Production where she has overseen product building, package inspections, and shipping of your orders for the past decade; or as she would put it, she keeps everyone and everything in line! She and her husband, Kerry, are still the envy of the dance floor at Christmas parties and the like. Serving as Grace's Production & Inventory Coordinator, Brandon Westendorf is a graduate of the University of Northern Iowa with a degree in Education and has been here for two years. Brandon's activities at work are self described as ensuring production flows smoothly and inventory is properly managed, but seeing him perform various tasks and duties around the facility will prove that there's so much more that goes on behind the scenes than everybody realizes. Outside of work, Brandon enjoys working out, sports, guns and wine; just not mixed together! 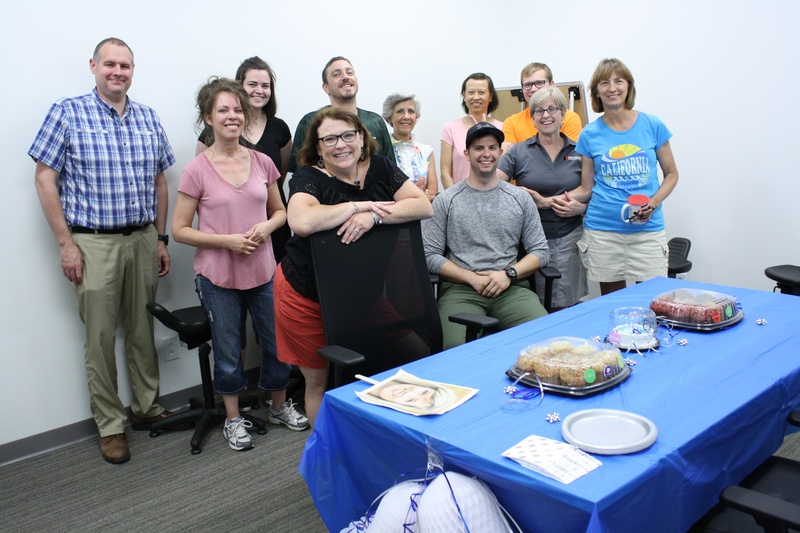 He was recently married so the team all pitched in for a "surprise" celebration that he totally did not see coming at all. Truth be told, everybody was so excited to surprise him that he knew something was up! Production recently hosted a team building challenge where, at one point, we had to assemble a GracePort blindfolded. This proved to be an impossible task for anyone outside their department. They know this business down to the literal nuts and bolts and have transformed with Grace from our humble beginnings to now a world class manufacturing facility. Having the ability to manufacture in the United States and compete globally is truly a testament to the ingenuity and efficiency of our Production team and leadership at Grace.